In terms of everything that Sean and I have done to improve our quality of life, renovating our kitchen has by far had the biggest impact. I feel like we probably said the same thing about our bathroom. And getting a new bed. And we definitely said that after we put furniture in our garden. But, seriously, having a new kitchen has changed EVERYTHING. To be honest, our kitchen wasn’t bad to start with. It’s a decent size for a London kitchen, had working appliances, and wasn’t falling apart like our bathroom was. However, we barely had any counter space. We had a dishwasher that we never used. And we couldn’t actually fit anything else in the cabinets, which sent us into a panic as we awaited our wedding registry items. So, after becoming obsessed with our bathroom renovation, we decided to renovate our kitchen, as well. 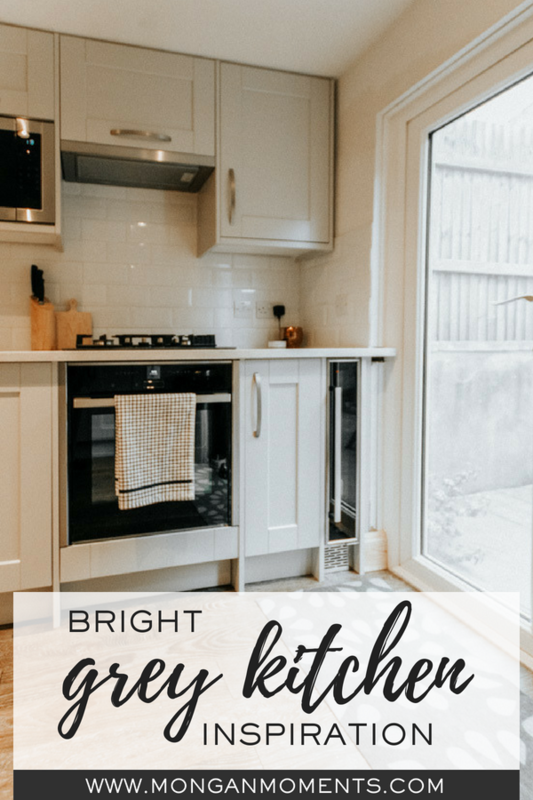 Today, I’m introducing you to our new kitchen; unfortunately, I don’t have any ‘before’ photos, but I have a ton of ‘after’ photos, and I know that’s all you came here for, anyway! 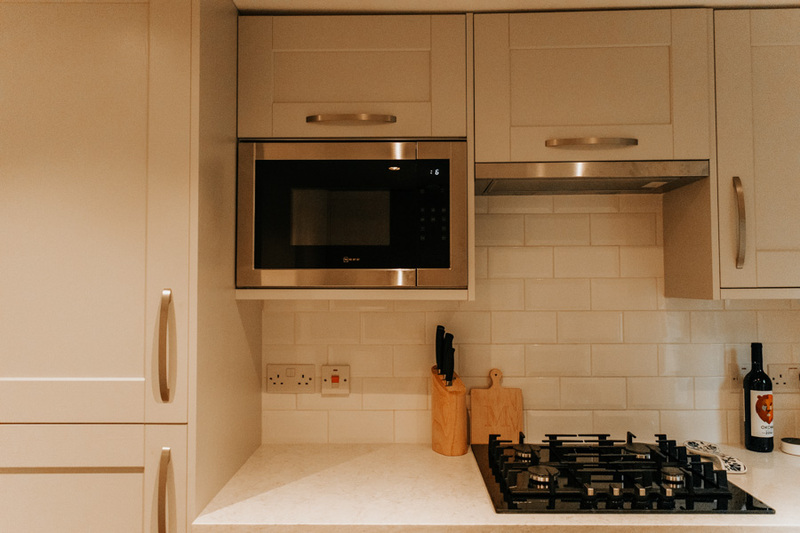 We did our kitchen renovation with Howdens (cupboards & doors), Croydon Granite (countertops), John Lewis (appliances), and our go-to contractor, Andy. We started by researching various kitchen companies, visiting their stores, and getting designs and quotes from them. These included IKEA, Wickes, and B&Q. 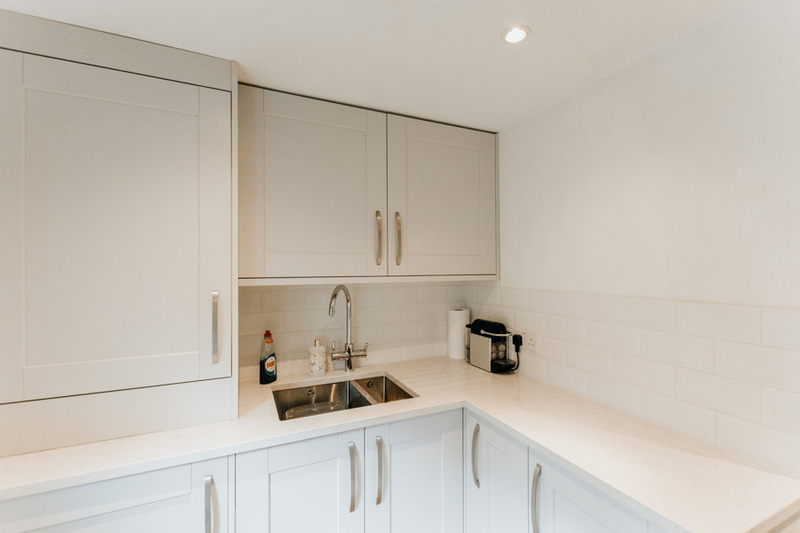 When we decided we would definitely go ahead with the kitchen renovation, we contacted Andy to get his availability and lock him in for the project. He recommended Howdens to us. Someone from Howdens came to our house and measured our kitchen, discussed design with us, and then provided us a plan and quote for the kitchen. We visited the Howdens shop (it’s right around the corner from us!) to pick out cabinet colors, countertops, etc. We didn’t love any of the countertop options, so decided to source our own. My friend, Megan, and I went to Croydon Granite to pick out counter top options, and then took the samples to Howdens to compare against our cupboards. I realized that I hated the color of the cupboards and decided to change EVERYTHING. After lots of back and forth via email about the quote and the items we needed to order, our kitchen was ordered. Sean and I moved into his parent’s flat in the beginning of December and handed it over to Andy to do our floors and kitchen. We moved back in at the end of February to this beautiful room! 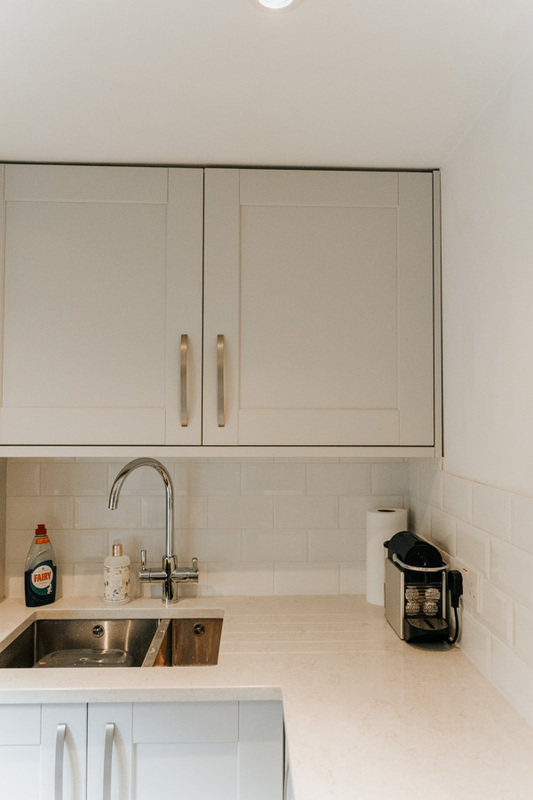 Sean and I lived in our house for two years before deciding to renovate our kitchen, so we had a really good idea of how we wanted to use the space. We knew, for example, that we’d prefer additional counter and storage space over a dishwasher. We also discovered that we owned more cooking oils and spices than we ever thought possible and wanted to be able to easily access them while cooking. 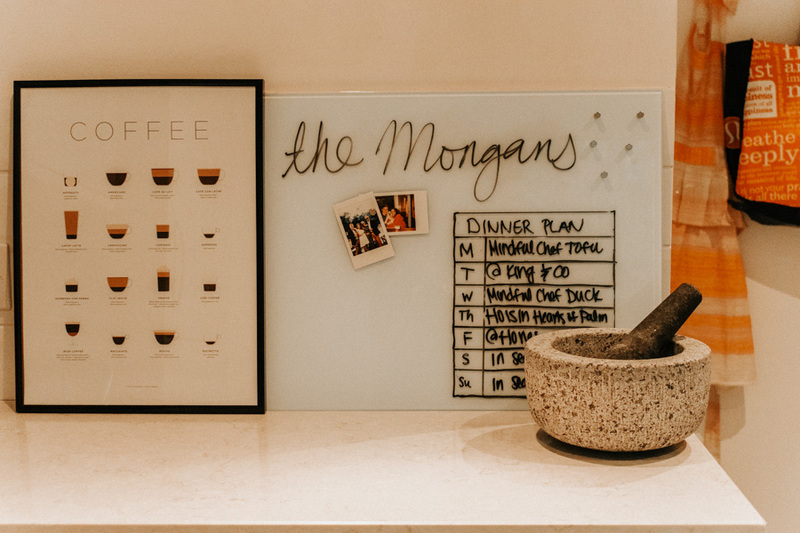 So we were able to make our kitchen renovation decisions based on our experience in the kitchen, which really helped us set our priorities straight. The cupboards and doors are done in Howden’s Fairford Dove Grey and Brushed Steel ‘D’ handles. Our floors are Brownie Lacquered Oak from UK Flooring Direct, and our walls have yet to be painted. You’ll probably notice throughout this post that the colors look different in some photos. Our kitchen is seriously effected by the light (or lack thereof); in fact, our entire house looks so different in different lighting. I took these photos at various times, so the colors are off in some of them. 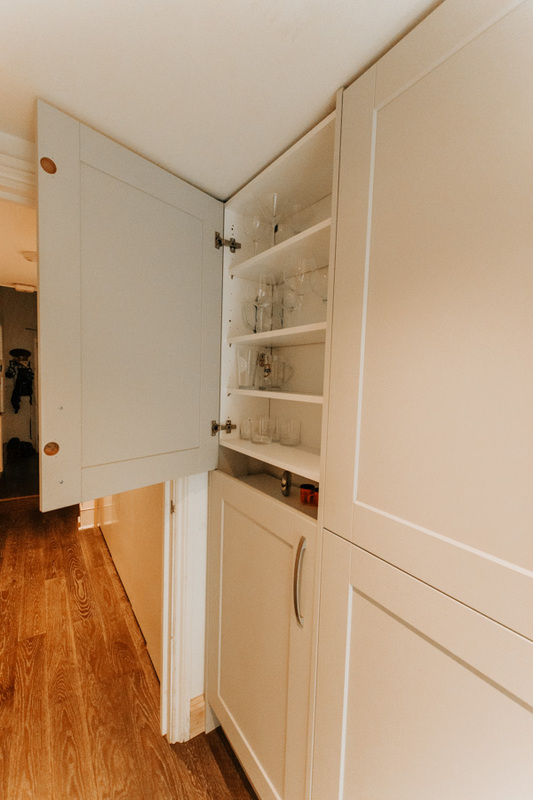 Given that we live in a small space and have lots of important items (like our Vitamix), storage was our number one priority going into our kitchen renovation. We basically wanted as much of it as possible, and we wanted the right type of storage. Prior to our renovation, we had three drawers to the left of the oven, and one cupboard on the right. The cupboard didn’t even have shelves and it pretty much only held our Vitamix. 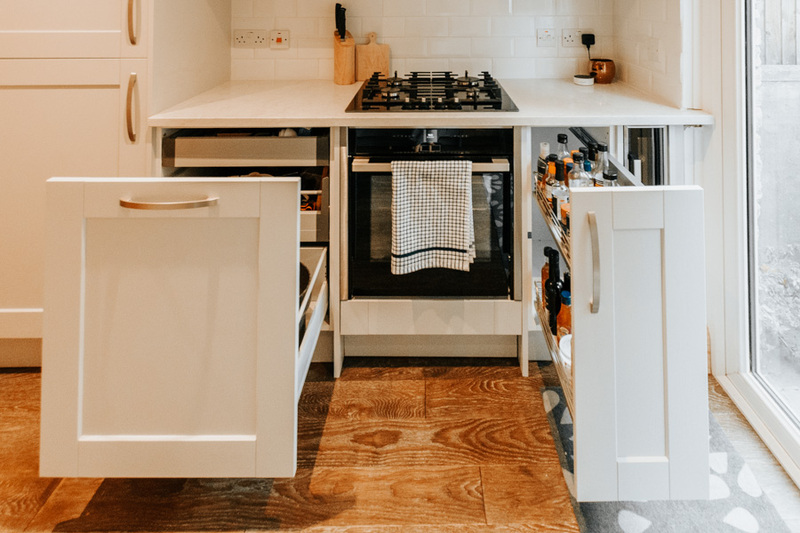 In the new kitchen, we decided on a large pullout with hidden drawers inside – these contain our silverware, cooking utensils, and pots & pans. On the right, we went with a pullout that offers plenty of storage space for spices and cooking oils. We put our most used spices on sauces on the top, and all of the oils on the bottom. No more olive oil on the countertop! We were also able to utilize the space under our oven by installing a pull out drawer. This holds most of our casserole dishes and flat baking trays, so they’re no longer falling on top of each other as we attempt to line them all up in a cupboard. With our wedding registry delivery around the corner, we were very worried about storage space for all of our new wine glasses. In our original kitchen, we had a space next to the fridge/freezer that was just open shelving. This became our spot for storing various bottles of alcohol and random things that we pick up around the house and are too lazy to put away. 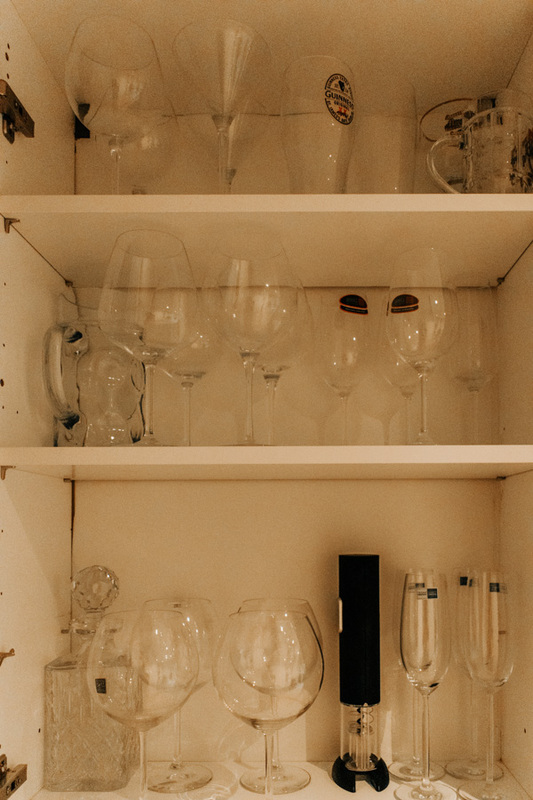 During our kitchen renovation, we decided to cover this section up, meaning to gave us an entire cupboard just for glasses. We have all of our nice glassware on the top, and a few random bits and bobs on the bottom – water bottles, decanters, etc. The biggest change to our storage situation was the counter space and cupboards that we added. Previously, the little half-counter on the right (and all the storage under it) did not exist. It was just a blank wall. Now, we have two pretty wide cupboards to store stuff in. One of them houses our Vitamix, casserole dishes, and chopping boards. The other has some mixing bowls and the appliances that we don’t use all the top, like our Spiralizer and Crock Pot. 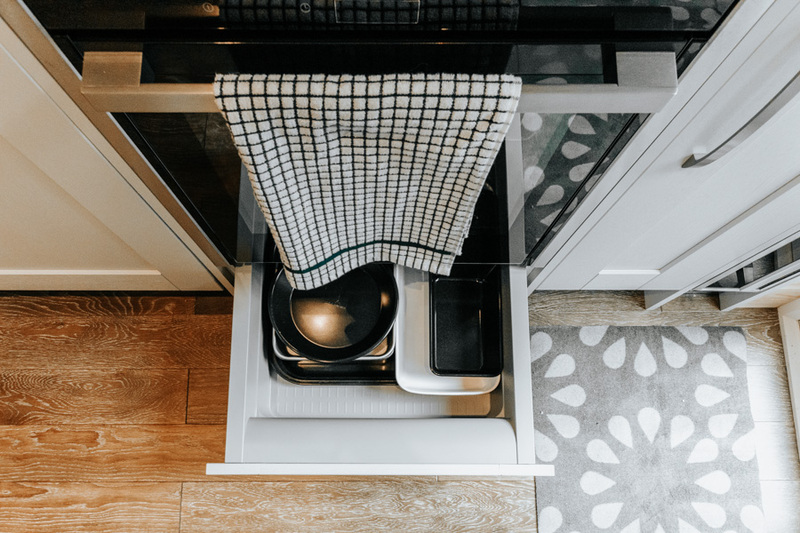 This is probably our favorite part of the kitchen because it gives us more storage space and more counter space, something we were really lacking before. It’s also home to our kitchen artwork (which we haven’t managed to get onto the walls yet). Although we didn’t really need new appliances, we saw our kitchen renovation as the perfect time to upgrade ours. The first step was to get our microwave away from our precious counter space. 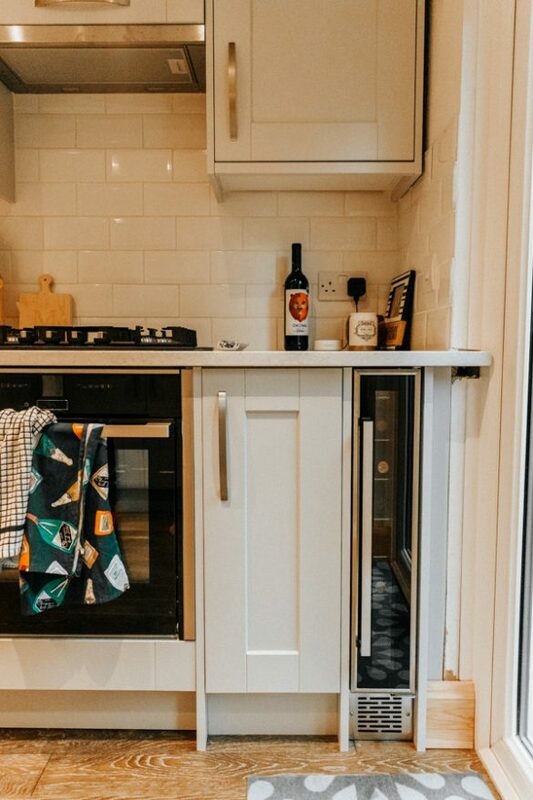 We chose a Neff built-in microwave that would fit alongside our cupboards. 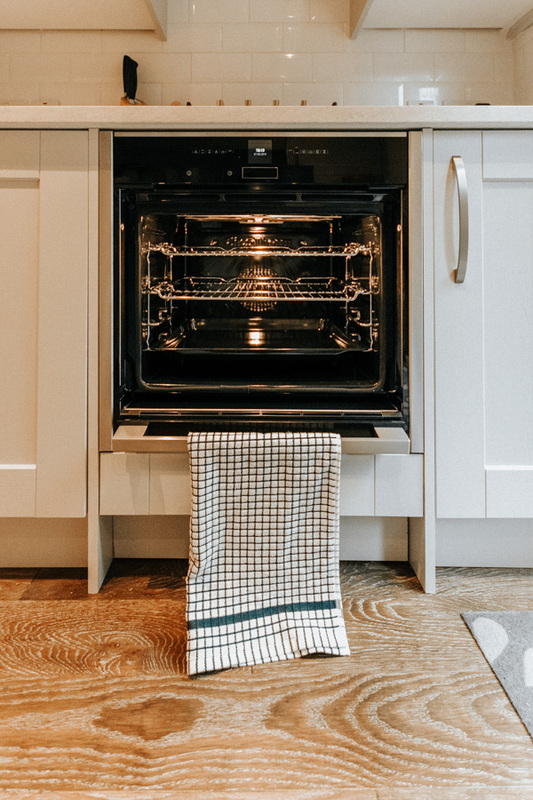 The oven and stove were the appliances that we cared the most about because they are the ones that we use the most often. 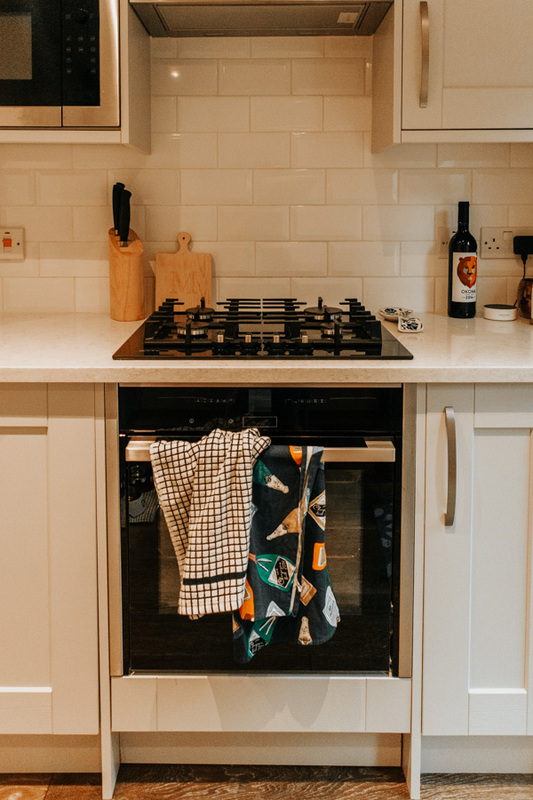 We stuck with Neff and chose a black glass top hob, since they’re easier to keep clean. For the oven, we splurged on a self-cleaning oven with a hideaway door. It’s a game changer! Above the hob, we have a Siemens Integrated Hood which means no more knocking our heads on our old one that stuck out way too far! We purchased a Neff Fridge/Freezer with much more space than our previous one had, and upgraded our Washing Machine to an AEG Integrated Washer/Dryer. 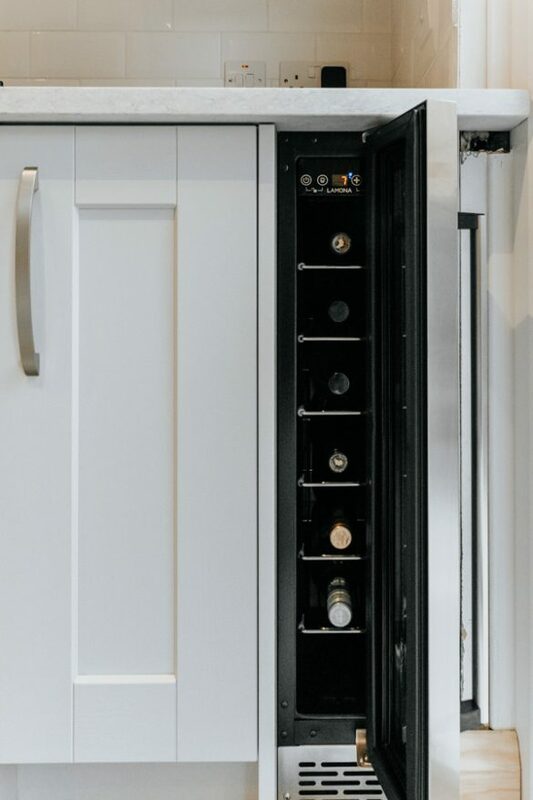 And, of course, we added a wine fridge – because, why not?! We seriously love being able to keep whites and roses nice and cold so they’re ready whenever we are! Our final appliance purchase was a boiling water tap. This allowed us to throw away our kettle, opening up even more counter space. We love having boiling water immediately whenever we want it – it take a full 10 seconds to make a cup of tea instead of waiting awhile for the water to boil! By finding storage space for everything, getting our microwave off the counter, and adding a new section of counter space, we ended up with probably 5x the amount of usable counter space than we had before. And it’s the best thing ever! Of course, with so much more counter space showing, we needed to have stunning countertops. We chose Silestone Quartz’s Snowy Ibiza from Croydon Granite. It’s white with a brown grain running through it that perfectly matches our floors. We love that there’s a contrast between the counters and the countertops, but it’s not a huge one. They’re also surprisingly easy to keep clean (I was worried about having white!) and really just look good all the time. It’s safe to say I’m obsessed! There’s no point having the most beautiful or high-tech kitchen in the world if it doesn’t serve your needs well. Think about how you use your kitchen – how much time do you spend in there? 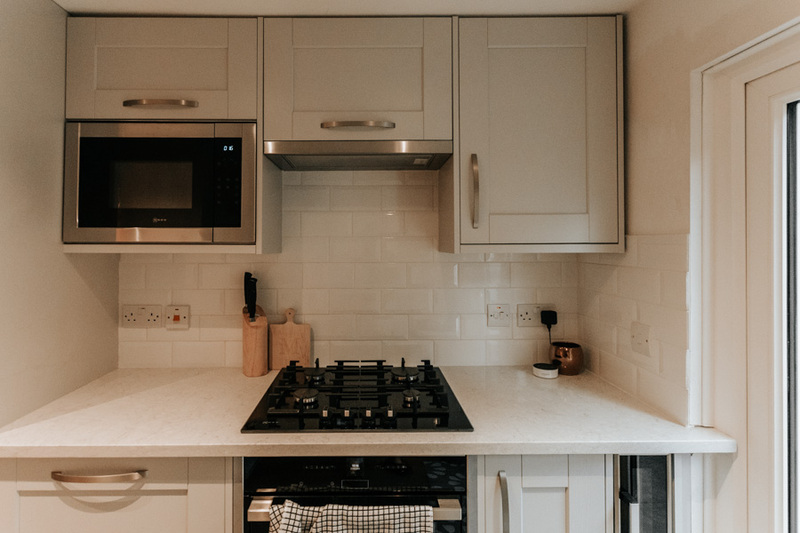 ; what items do you feel are missing from your kitchen? ; what do you always like in other kitchens? Once you think about how you use your kitchen, you can prioritize your needs. For us, it was storage space and counter space. We cared more about that than having a dishwasher or a wider sink or a bigger hob. 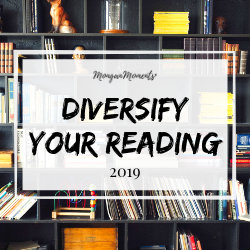 But your needs are probably different – prioritize YOU! 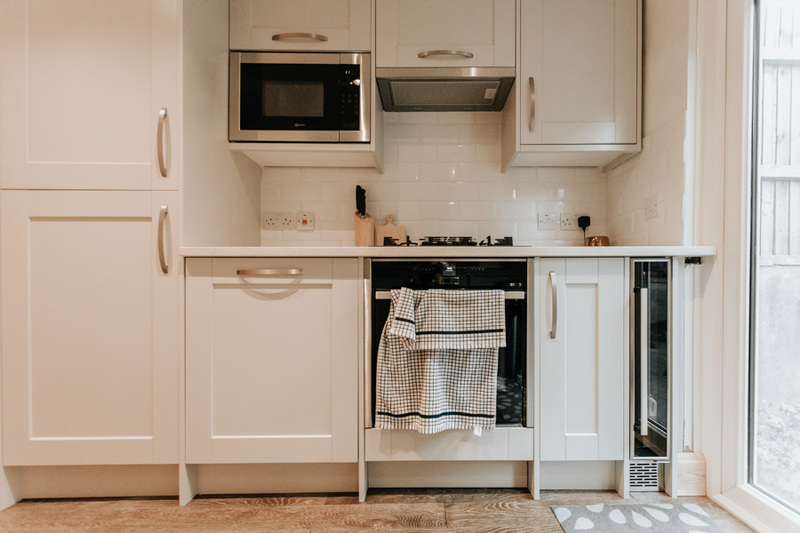 We have heard so many horror stories about someone being a couple of centimeters off in their measurements and needing to reorder the entire kitchen. Seriously, it happens. If you have the option to have a contractor or designer come to your house and do measurements for you, take it! No matter how great you are with a tape measure, I guarantee they’re better. And their drawings are better, too. 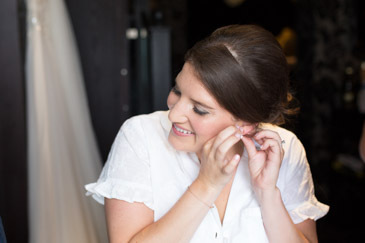 You won’t regret bringing in a professional in order to guarantee accuracy! When it comes to anything you’re unfamiliar with, make sure you do a ton of research. 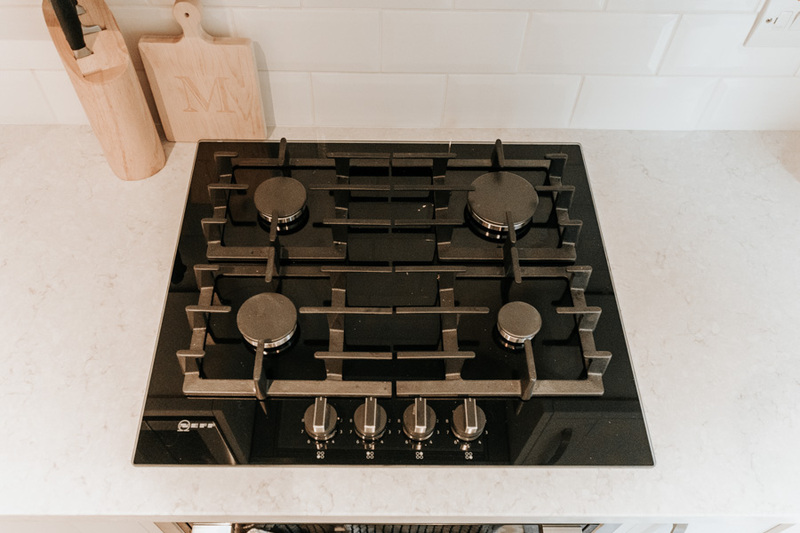 We spent countless hours trying to figure out which floors were best for kitchens, whether we wanted granite or quartz, and exactly what to look for when purchasing new appliances. For appliance research, I highly recommend ao.com – even if you don’t purchase from them, they have a ton of reviews and videos about each appliance. I never knew that refrigerators could have so many features until watching their videos! We spend a rather absurd amount of time in our kitchen, considering there aren’t even seats in there! But it’s such a clean, bright space that we love just standing in there and catching up, or sipping our wine while we cook. 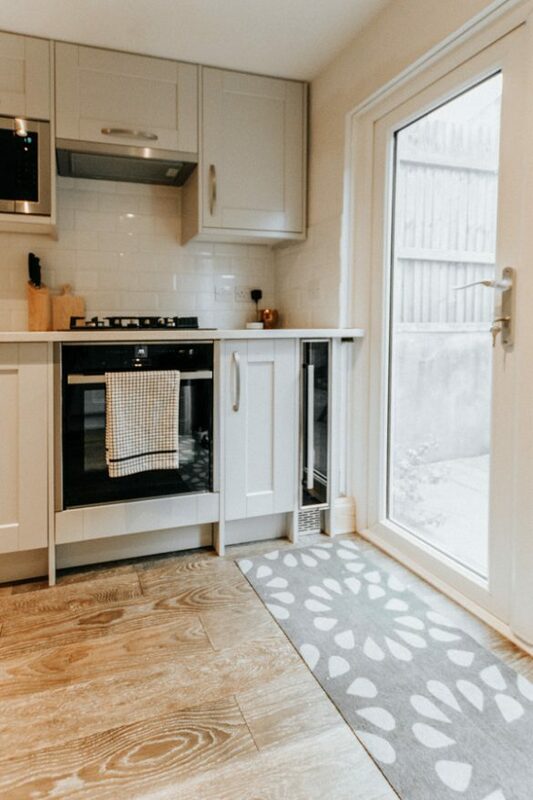 We now both have space to chop, there’s plenty of space to move around, and we feel like it’s a room we actually want to be in, not just go into because we need to cook. 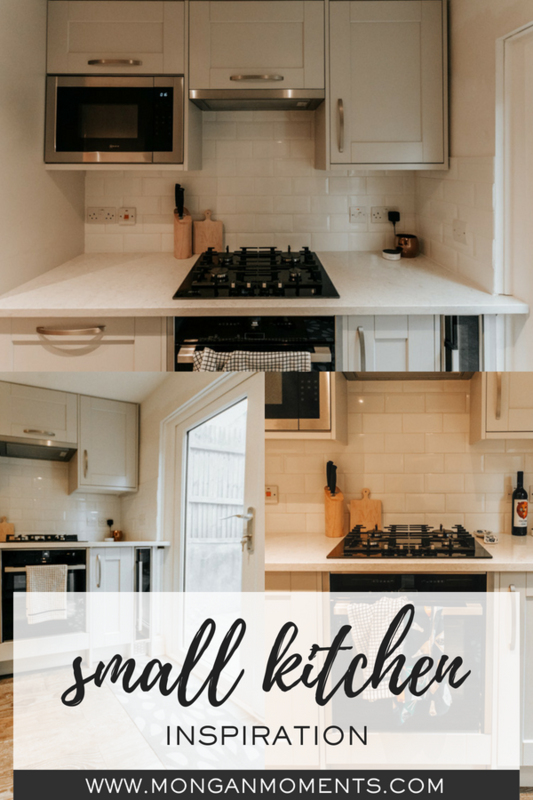 I never thought that adding a counter and cupboards to our kitchen would make it feel bigger, but it really does! Adding that additional storage has not only opened up a ton of useful storage and working space for us, but it has also made the room feel more spacious and more put together. It’s easily the best design decision we’ve ever made. And, with our kitchen, bathroom, and floors taken care of, our home is finally feeling like a home we never want to leave! Pin to your Kitchen Inspiration board!